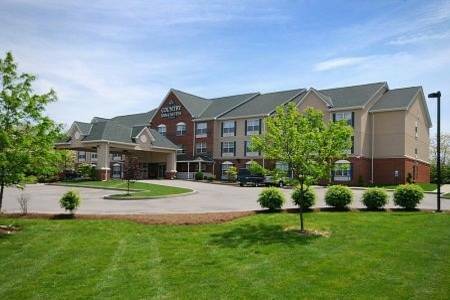 The Country Inns & Suites By Carlson Fairborn South is situated within 2 miles of the Fairfield Commons Mall. Complimentary continental plus breakfast is included for all rates. The property also offers a 24-hour front desk, complimentary newspaper Monday through Friday, complimentary parking, complimentary local calls, and complimentary High Speed Internet access. Other amenities include coin laundry indoor pool and meeting facilities. Unless specifically given permission by the front desk at time of check in, any check out later than Noon is subject to One nights room and tax charge. Across street from the hotel. Located 1.5 miles from the hotel. Located 2 miles from the hotel near a mall. Located 1 mile from the hotel. Lunch buffet available at lunch. Located 2 miles from the hotel in Barnes & Noble Booksellers. Located 3 miles from the hotel. Breakfast is served in the breakfast room across from the front desk. Can accomidate 25 people, depending on the setup. Total square footage is 576 feet. World's largest military aircraft museum. Visit this website www.wpafb.af.mil/museum/ for more information. -The Wright Cycle Company. Open daily from 8:30am to 5:00pm. -Paul Laurence Dunbar State Memorial. Mon-Sat 9:30am to 4:30pm.Sun 12pm to 4:30pm. -Wright Brothers Aviation Center at Carillon Historical Park. -Huffman prarie flying field. Celebrates the invention and contributions of Dayton's pioneering community with exhibits and artifacts. For more info please visit www.carillonpark.org. A 70 foot high conical burial mound build in 1000 BC. The world's only full-time museum dedicated exclusively to the classic Packard luxury car reveals more than 50 automobiles on view in the restored art-deco style showroom. John Bryan State Park is a scenic state park in Western Ohio. For more info call 877-767-1274. Tandem skydive and accelerated free-fall program. For more info call 937-372-0700 or visit www.skydiveohio.com. NHRA Drag-racing on the quarter mile strip and NASCAR Winston Racing Series stockcar racing on the three-quarter mile oval April through August. For more info call 937-426-2764 or visit www.kilkare.com. Four trail systems combine to form the Greene Ways Shared Use Trail Systems providing over 60 miles of shared-use trails in Greene County. The Little Miami Scnic Trail is a 70 mile trail running from Milford to Springfield. The whole family can enjoy delicious ice cream and petting the farm animals. Miniature gold, restaurant, heated driving range, and gift shop. For more info call 937-325-0629 or visit www.youngsdairy.com. The Madonna of the Trail is a stony-faced pioneer Mom, in long skirt and bonnet, strutting with an infant in her arms. Playful brainchild of store owner Jim Bonaminio, the elaborate, animated displays distract children long enough for parents to complete shopping. Newfangled paving material was guaranteed for five years when it was poured in 1891. Only foot traffic is allowed now, so it should last for several more centuries.